Funeral for Carolyn Brazee will be held at Spirit of Truth, Thursday, April 4, at 2:00 pm. Carolyn is the mother of Barb Dawley. Please remember Barb and her family in your prayers. We are in the midst of the season of Lent. Over the past few weeks, we have focused on the biblical narrative of the passion of Christ as seen through the words of the familiar hymn, “Ah, Holy Jesus.” This several hundred year old hymn captures the essence of Christ’s suffering on our behalf, and relays to us the tremendous gift we have been given through Christ’s life, death, and resurrection. Our observance of Holy week begins with Palm Sunday worship at 9:30 followed by a breakfast served by the youth of our congregation that are planning for a short-term mission trip to Jamaica in June. We will have worship services on Maundy Thursday, April 18 at 7:00 p.m., and on Good Friday also at 7:00 p.m. The Maundy Thursday service will include First Communion for our Fifth Graders. 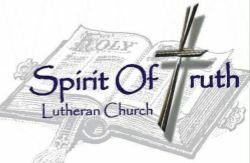 Spirit of Truth will also be hosting Heritage Lutheran at the Good Friday service. Holy Week concludes with our celebration of Christ’s glorious resurrection on Easter Sunday morning at 9:30. Please make it a priority to gather for worship on these special days. God bless you on your Lenten journey! April 18th Maundy Thursday service, 7:00 p.m.
Sunday, May 5, Senior Sunday at Spirit of Truth, Seniors will be recognized and are asked to bring pictures and items to share with the congregation during the reception during the coffee hour. Quilting on Wed. April 10, 2019 at 9:00 A.M. Potluck lunch at noon. Tuesday, April 16, 1:30 pm – Spirit Lifters meets the 3rd Tuesday of the month at the church to make cards. Sunday, May 5 – Graduation Sunday, honoring high school/college graduates. Please email the church with information on your graduates as to accomplishments and future plans, along with a picture. We plan to do a picture page with information on each graduate for the May newsletter. There will be tables available for them to set up a small display of pictures or awards they have earned. Past students have made poster boards or brought something for people to write advice in. We will be baking Easter themed cookies and surprising community members with them. We will need adult volunteers! Please sign up on youth table!! Supper will be provided. Last day of regular youth group for High School is May 12 and for Middle School is May 15. We will serve breakfast. The sign up to bring food is on the youth table. Please bring donated items to the youth room, if you have large items please contact Alice Jacobson for them to be dropped off at our rummage location in Brandon. Thanks to those who helped deliver backpacks in March and brought paper good and cleaning supplies for the Brandon Food Pantry. We are most grateful for your recent donation to our church and ministry here in Jamaica. It was extremely generous of you to remember us as we continue to grow and try to finish our new building. God is good and we add on a little to the building as God provides the finances. We are also still enjoying all that you sent us on the container. I went to Africa this year on a missions trip so not sure if I will get to the states but will be coming to see you again in the future as God provides.